Tributes to a suspected burglar who was stabbed to death has been torn down.Friends and family of Henry Vincent, 37, had tied floral tributes to a fence opposite a home in Hither Green, south-east London, where he was killed last week.However, overnight the majority of the bouquets and balloons have been taken down and left on the pavement.The homeowner Richard Osborn-Brooks, 78, was held on suspicion of murder, but released with no further action.The Met Police says it has not taken down any of the tributes from the fence opposite Mr Osborn-Brooks's house. A 33-year-old neighbour, who did not want to be named, told the BBC he feels "intimidated". "I think that it's really sad that someone's died and I think that, it's not their fault that he's died and it's up to them to grieve for him however they want to do it," he added. "It is quite stark and you can't help but feel it looks a bit confrontational. "It's a massive, massive display right in front of the house. If the family want to lay flowers that's fine but it feels weird. It feels a bit aggressive to be honest." Members of Henry Vincent's family, understood to be from the travelling community, arrived on Monday with lots of tributes. 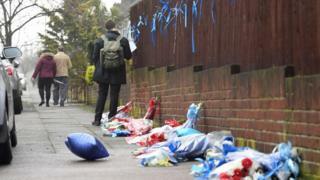 However, some time during the night the balloons have been cut and are either floating around or lying soaking wet on the pavement.The rest of the flowers are lying on the ground.There is a tribute on the railings of a teddy bear, with quite emotional messages, from Mr Vincent's children. Notably it is the only one left hanging.Richard Osborn-Brooks' house is boarded up and there are police officers outside the home, but a lot of people in this neighbourhood just want everyone to go away. Local resident Nikita Hill, 39, said: "I don't think they should have put it outside his home. "Maybe they could have done it further away. But he's got loved ones and family too so I understand why they did it." A resident who gave his name only as Peter said: "I wouldn't want them on my wall anyway put it like that. They were climbing the fence and everything [on Monday]. "Will he [Mr Osborn-Brooks] ever be able to come back and live here? I doubt it. It is sad." Police had been called to Mr Osborn-Brooks's property at about 00:45 BST on 4 April over reports of a burglary when they found Mr Vincent collapsed in nearby Further Green Road.A witness said an accomplice dragged Mr Vincent toward a van before leaving him for dead.On Monday, the Met Police said 28-year-old Billy Jeeves was wanted in connection with the burglary. Mr Jeeves's white Vauxhall Astra van was found burnt out and destroyed in Star Lane in Orpington, Kent, on Saturday evening.Detectives want to hear from anybody who may have seen the van - with the registration GU52 AXT - in the days and hours before and after the burglary.In January, Mr Jeeves and Mr Vincent were named and pictured by Kent Police in connection with an investigation into a distraction burglary on a man in his 70s.